Mangahigh.com is on the lookout for the top maths school in South Asia! This online maths competition will invite all schools across the region to compete with each other across the 12 day challenge period of the Maths Ninja Challenge. Students complete maths activities, which in turn contributes medal points to your school's tally! Lessons are automatically assigned to students based on their age, so it's very simple to get started! Teachers may further personalise their students' learning by assigning specific Mangahigh lessons to them using our easy-to-use teaching platform - we highly encourage this, however, this is NOT essential for participation. This is a great opportunity to see the impact digital game-based learning can have on your students whilst also increasing the profile of maths across the school. It's free to join, and there are amazing prizes up for grabs! What is the Maths Ninja Challenge? With Mangahigh, students have full access to awesome math lessons all day, every day. This means students can work through the lessons at home, or in class - providing a great opportunity to see the impact digital games-based learning can have on students, while also dramatically raising the profile of math at your school. Students are extremely enthusiastic about such challenges and teachers often use this as an opportunity to set extra work for students during the period of the challenge. Students earn medal points by completing curriculum-aligned games and adaptive quizzes on Mangahigh. All points accumulate towards the school's running total which places the school on the Maths Ninja Challenge Leaderboard. The Mangahigh system automatically provides a list of activities for your students to complete, based on their age, and performance on various topics. These are found under the Recommended section on the Students Page. 1. Register your interest in the competition by filling out the form below and selecting a training session that suits you and other members of staff. Please note that only 1 teacher needs to register on behalf of your school. Additional teachers can be added within your trial Mangahigh account. 2. Inform other teachers in your school about the competition. If they can't make the same training date as you, they are welcome to sign-up independently and pick a different training date. Note, the more teachers from your school that participate, the better your chances of winning the competition. 3. We'll set up the student accounts for your school (if you are new to Mangahigh). To speed things up, please send your student list as an Excel file arranged in three columns (first name, last name, and class) to support@mangahigh.com ASAP. Please note: 1 login per student only, no student may participate using multiple logins. You can have as many student logins split into as many classes as you'd like. If you're not sure of the breakdown per class, simply email us the total number of students you'd like to take part. If your students already have Mangahigh logins set up, you can use these. If your students already have Mangahigh logins set up, but you would like to issue them with new ones during the competition to allow for more point scoring opportunity, just email support@mangahigh.com. The competition is open to all schools in India, Pakistan, Sri Lanka, Afghanistan, Maldives, Bangladesh, Bhutan, Nepal and Mauritius, regardless of school size, location and previous experience with Mangahigh.com. You are welcome to enrol as many teachers and students as you like. You are highly encouraged to attend one of the training session. If you can't make these times, please get in touch with support@mangahigh.com and we'll arrange for you to attend an alternate session, or provide alternative support to assist you in getting ready. Featuring a powerful suite of classroom management and analytical tools, Mangahigh provides teachers with everything they need to teach maths in a fun and engaging way. Mangahigh.com is an online platform for delivering maths education in schools. Currently in use by over 5000 schools globally, Mangahigh helps deliver the curriculum through purpose built games and game-like activities to support and engage 21st century learners. Mangahigh's maths content library offers comprehensive coverage of international and Indian curricula for ages 5 - 16. When are the dates of the competition? The competition will run from 29th April to 10th May 2019. Is there a COST to my school? 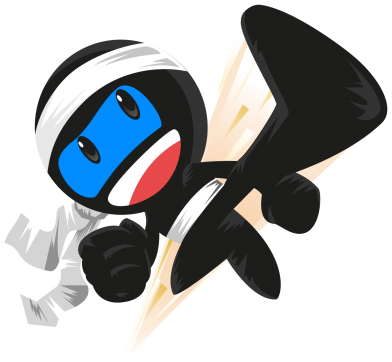 The South Asia Math Ninja Challenge is FREE for schools to participate in and there is NO obligation to continue to use the Mangahigh after the challenge. How many teachers / students need to participate from each school? You are encouraged to enrol as many teachers and students as you like. Register your interest by completing the form above. What format are the training sessions and how long will they last? What age levels does Mangahigh cover? What types of activities are available on Mangahigh? Mangahigh offers 900+ activities split between arcade style games and traditional quizzes. What locations are eligible to participate? How will you protect students' personal data? 1. 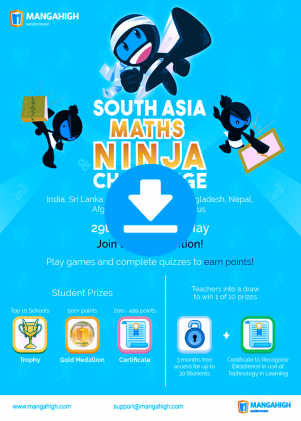 To enter the South Asia Maths Ninja Challenge (the 'Challenge') your school must be a registered school located in South Asia and have a school account on Mangahigh.com. 2. The Term of the Challenge will run from 29th April through to 10th May 2019. 3. Only bona fide schools are eligible to compete in the Challenge. Home schools or non-school organisations are not eligible. 4. Only bona fide students are eligible to participate in the Challenge. A student may participate with 1 student login only, issuing multiple logins to one student is not permitted. Schools with anything more than experimental use from academic staff during the Term of the Challenge may be excluded from the Challenge. 5. Any foul play, cheating, or attempted manipulation of the results will result in a permanent exclusion of the offending school from the Challenge. Mangahigh's judgement on this point will be final. 6. In the event of an exact tie, Mangahigh's judges will take into account school spirit, and the number of skills mastered per participating student, to determine a single winner. The judges' decision will be final. 7. The winning school will be announced shortly after the competition finishes. 8. By entering the competition the winner agrees to participate in such reasonable promotional activity and material as Mangahigh may require. 9. This competition will be operated by Blue Duck Education, Ltd. 1st Floor, 4 Tabernacle Street, London, EC2A 4LU. 11. Mangahigh will offer full and unrestricted access to all participating schools for the duration of the competition. 12. The competition will only run if there are MINIMUM of 15 schools taking part. 13. All students earning 500+ new medal points during the period of the Challenge will win one Mangahigh Maths Medallion, which will be sent to their school following week after the competition ends. 14. The top ten schools on the leaderboard at the end of 10th May 2019 will be announced within 2 business working days. Prizes will be forwarded to winning students and teachers within 2 weeks of the completion of the challenge (actual delivery times will vary depending on location). 15. Prizes will be awarded to the school and it is the school Principal's choice as to how they wish to spend the money.